So last weekend at Project Motor Mouth I debuted my ULTIMATE Six Frock Coat. A lot of people asked for my photo - but I know you wanna see some proper quality images of how the coat came out, so here they are. I’m so happy about how it’s turned out. Better than I could have hoped. 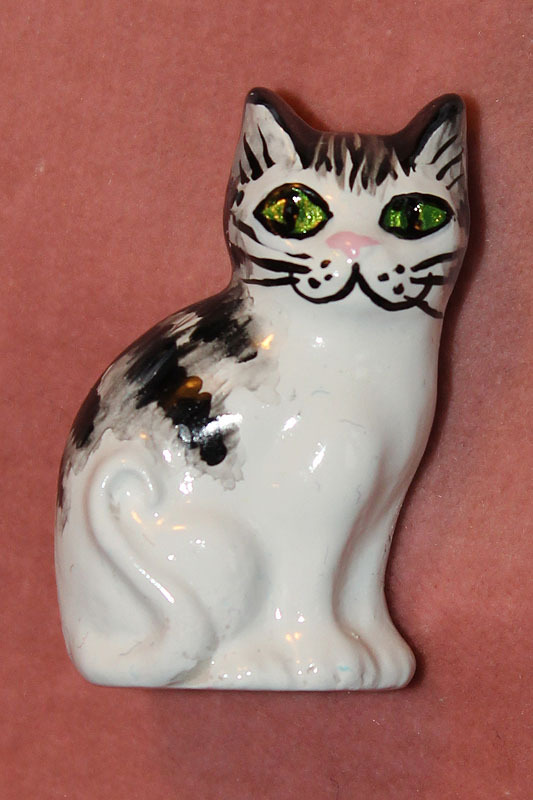 As you can see, the lapel sports one of the original-style cat brooches as screen-worn. Check back soon for the chance to get hold of a PERFECT replica of this brooch! 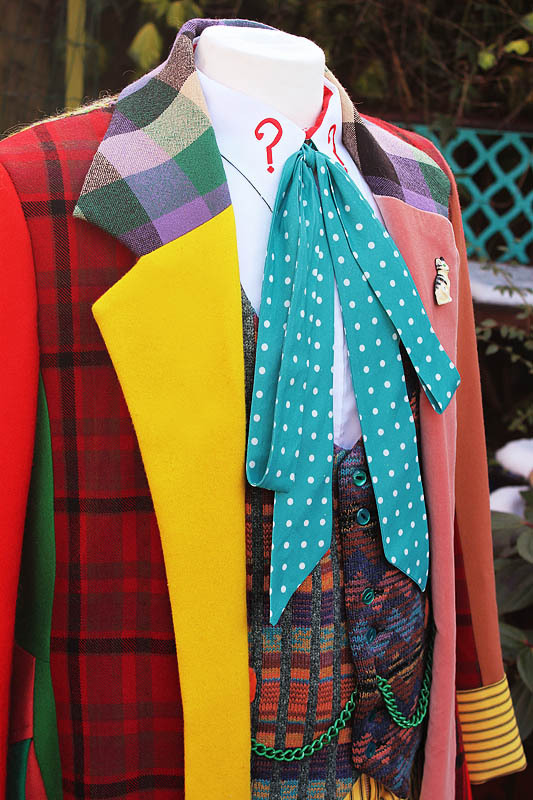 Now you might have noticed that under the Frock Coat is a rather special waistcoat. 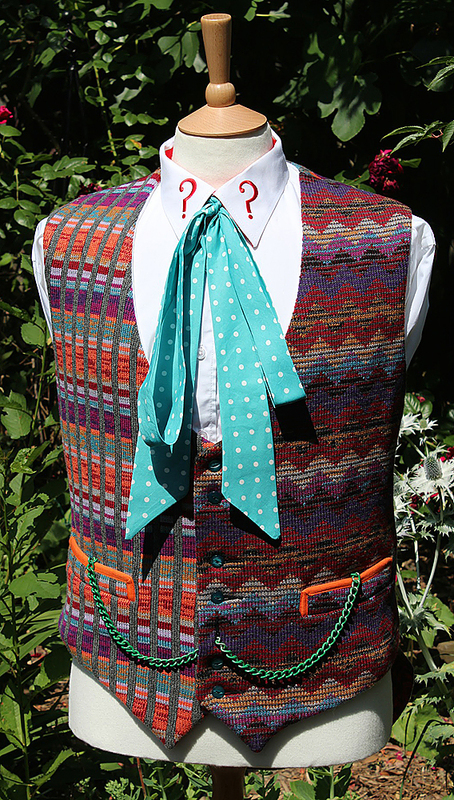 It is my copy of the season 22 waistcoat with knitted fronts. I’ve been keeping this one under wraps for several months now, but finally you can see it and I’ll show you it properly very soon. 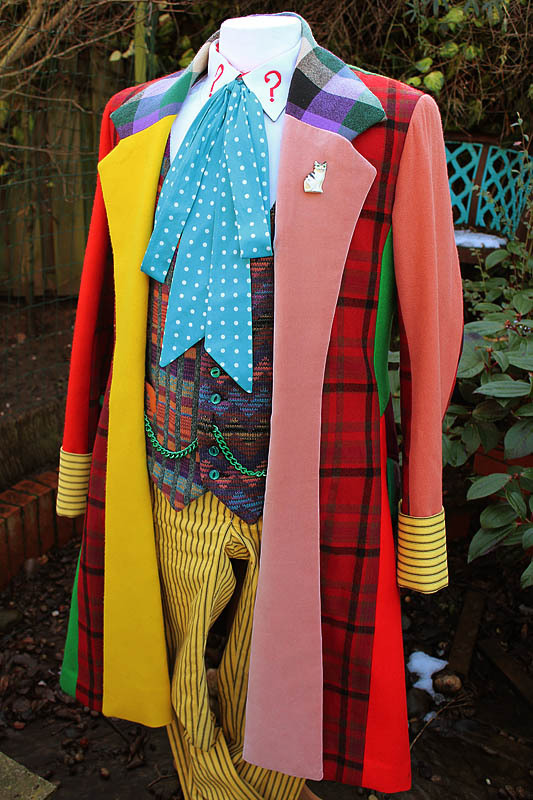 Do let me know what you think of the finished coat. Has the three years of work paid off? You tell me! * Gob-smackingly good. * Three years extremely well spent I'd say. Got any nice crisp shots of the back? Phenomenal... Incredible detail; the coat, the waistcoat, the boots, the cat brooch. Well done, you should be justly proud. Glad you got a photo with the man himself. It looks fantastic! How do you get your cravat tied and looking perfect like that? Is there a site I can go on an learn how to tie it perfectly like in the picture? Thanks! The cravat goes round the neck and is tied in a single knot at the front. Hold the two ends of the cravat around 12 inches from the knot and bring them up to the knot to create two long loops about six inches long. Tie these two loops together with a single knot. Tighten it up to the first knot and you should have a nicely tied cravat with good length loops of fabric. The 3 years have certainly paid off its fantastic! Well, I have to say, those three years were very well spent! Excellent work - you couldn't even distinguish it from the original! Oh, that is SO beautiful! I want to weep. I didn't think I'd ever see anyone do it - but you did! I've been following your blog with much excitement and I can positively say that, YES, the three years of work was well worth it. Well done on a FANTASTIC job! This is probably the most epic costume I have ever seen. 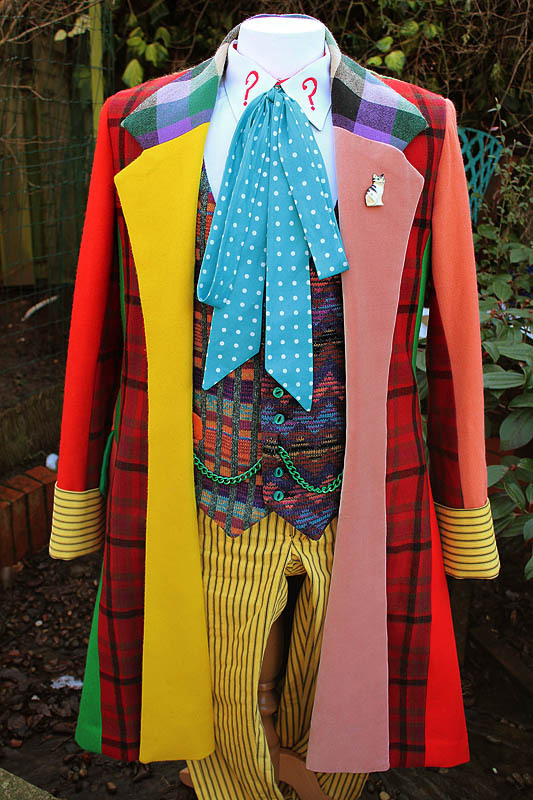 I now sady realise that I will never be able to get a costume like this, since, firstly, I can't for my life work well with fabric and sweing and all that, but this one is absolutely brilliant. Congratulations on finishing such a fantastic piece. Such a gorgeous coat! A fantastically accurate job and so professional. We'll done! Really looking forward to getting my hands on one later in the year! This is a great coat! I really want one! Can be arranged - contact me! What did you use for the green chain?? It's a placeholder for the moment - a hardware store bought steel chain, lightly sprayed with green paint. Let's say I wanted one of everything for the 6th Doctor, one coat, one waistcoat, one pair of trousers, one chain, one cravat, one pair of boots, and one pin, how much would it be all together, and do you still have at least one of everything available? If you email me direct at tennantcoat@me.com I'm sure I could help you with your needs there. 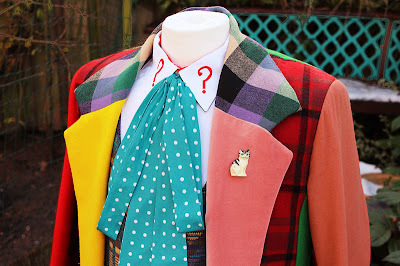 would you post pics of your pattern templates so i can make my own version coat? I should make it clear for all to read that I never release the patterns I have created, nor sell the fabrics I have specially commissioned. 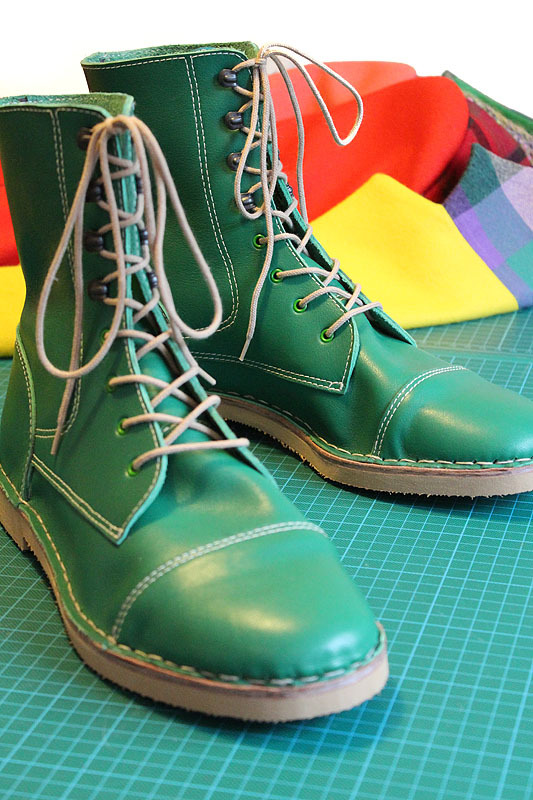 A great deal of work and time has been invested, and although I am happy to share my experience in creating them, I cannot be treated as a fast-track to making your own. I'm a late comer to this post, would you still have any spare fabric for sale available from this coat? Thanks for this blog, it is a great reference tool. 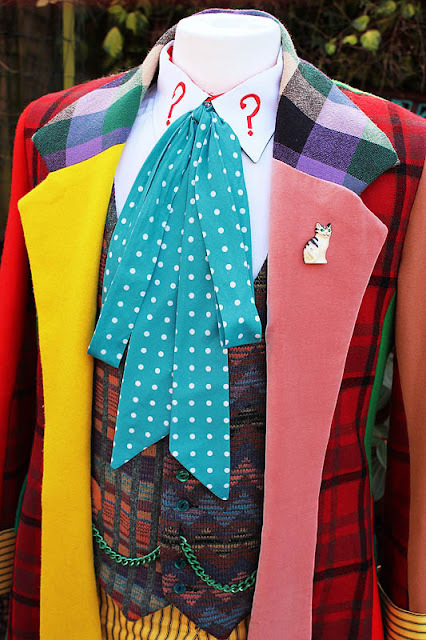 Ultimate Six Frock Coat - purrrrrrfection!